FIVE NEW ORLEANS police officers were in court yesterday as their trial began for allegedly killing two men without justification in the chaotic aftermath of Hurricane Katrina. Ronald Madison, 40, and 17-year-old James Brissett were both killed by police bullets at Danziger Bridge in then-flooded New Orleans. Ms Bernstein said the officers continued to shoot at members of one family as they lay wounded; one shot Mr Madison in the back as he fled, and another stamped on him as he lay dying. She added when the officers realised they had made a mistake, they arranged fake witnesses and planned to drop a gun at the scene, the BBC reports. Former and current officers Robert Faulcon, Robert Gisevius, Kenneth Bowen and Anthony Villavaso are charged with the shootings. Arthur Kaufman faces charges over the alleged cover-up. 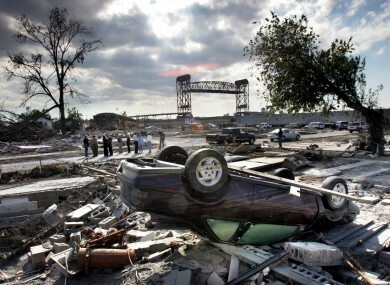 Email “Five cops on trial over killings after Hurricane Katrina”. Feedback on “Five cops on trial over killings after Hurricane Katrina”.